FIFA [ ] has finally acknowledged that there may be something wrong with the Jabulani World Cup ball and will act on it after the World Cup. Many players have likened the Jabulani to a "supermarket ball," saying it is too unpredictable and flies through the air too easily. "We're not deaf," FIFA secretary general Jerome Valcke said today at a news conference. 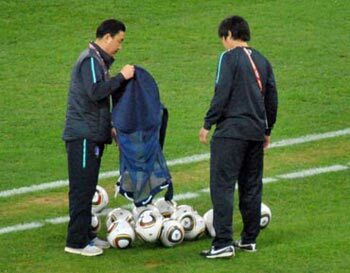 "FIFA is not unreceptive about what has been said about the ball," he added. Valcke said that FIFA will discuss the matter with coaches and teams after the World Cup, then meet with manufacturer Adidas. "There are rules for size and weight. But the ball has to be perfect," he added. Goalkeepers have often complained about the ball at every World Cup. But this time round, even the strikers and coaches have blasted the ball. Brazil [ ] manager Dunga, in fact got into a verbal spat with Valcke over the Jabulani before the tournament, challenging the FIFA executive to come out onto the pitch and attempt controlling it. Denmark defender Daniel Agger said the ball made some outfielders look like "drunken sailors." The Jabulani could create even more problems in the knockout phase, since games could be decided by penalty shootouts. "The balls have changed over the last couple of years, they have become a lot faster and in addition to that in Johannesburg we are playing at an altitude of 1,700 meters, which makes the ball even faster," former Germany  goalkeeper Oliver Kahn said. "Thus the goalkeepers work even harder, but I don't think that we can take the ball or the altitude as excuses," he added. "There's a lot of talk about stadiums, infrastructure and TV and that's nice and all, but first we've got to worry about balls, spikes and jerseys," Italy [ Images ] goalkeeper Gianluigi Buffon said. "I don't see why we can't just go back to the old black-and-white checkered version we all played with as kids," he added.